March 5, 2013. Teresa Mills, from the Center for Health, Environment & Justice, filed a formal petition with the U.S. EPA claiming laws passed in Ohio violate the United State's EPA "Community Right To Know Act. ", specifically those that exempt the oil and gas industry from disclosure of chemicals they use. This is a Petition filed by the undersigned, Teresa Mills of Grove City, Ohio, on behalf of herself and all residents across the State of Ohio, to request that the United States Environmental Protection Agency take action to avoid imminent public harm and to protect the public right-to- know arising from actions taken by the State of Ohio that are clearly unconstitutional under the Federal Supremacy Clause for violating the Emergency Planning and Community Right-to-Know Act of 1986 (“EPCRA”), Pub. L. No. 99-499, Title III, 100 Stat. 1728 (1986). Ohio has been in violation of EPCRA since 2001 without any response to date from the United States. That violation was first created by the passage of House Bill 94, followed by the adoption of Ohio Revised Code (“ORC”) Section §3750.081 in September, 2001, that essentially exempts the oil and gas industry operating in this state from requirements under EPCRA requirement that facilities within those industries annually file emergency planning inventory forms with state and local emergency planning authorities. The violation was further compounded by passage of SB 315 in 2012, followed by the adoption of ORC Section §1509.10 (H) and (I), which divert trade secret determination authority from U.S. EPA and unduly restrict citizens’ ability to challenge trade secret claims. Petitioner is requesting that U.S. EPA review this situation on an expedited basis and remedy it through taking the actions: 1) publishing a formal determination that ORC §3750.081 and ORC §1509.10 (H) (I) violate EPCRA; 2) inform relevant state agencies and legislators of aforesaid determination and 3) after a reasonable period of time following such publication, undertake enforcement actions against oil and gas facilities operating in Ohio that remain in non-compliance with EPCRA’s requirements. 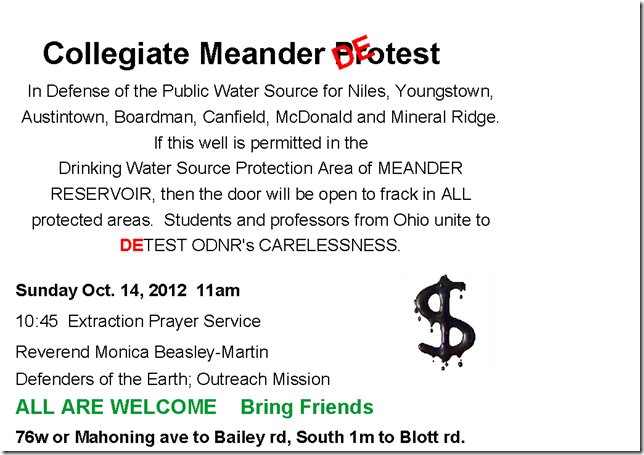 fracturing (“fracking”) near Muskingum Watershed Conservancy District (MWCD) reservoirs. policy of refusing to sell reservoir water for fracking. flow systems, eventually moving upward into freshwater aquifers, reservoirs and waterways. health and environmental impact assessments. also endangers public health. We endorse the many recommendations made by HydroQuest. disposal, which also includes the spreading of “brine” (frack waste) on public roadways. 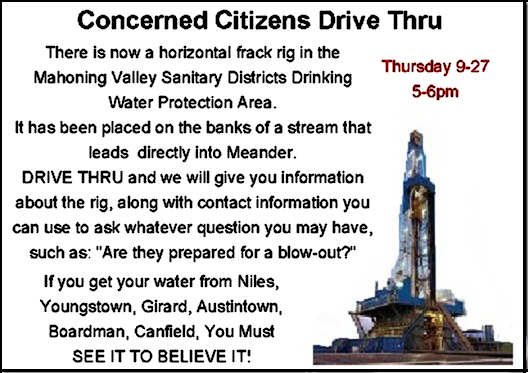 There is now a horizontal fracking rig in the Mahoning Valley Sanitary District's Drinking Water Protection Area. It has been placed on the banks of a stream that runs directly into Meander Reservoir. as to whether the district, the emergency responders and the operators are prepared for a blow-out. There is now a horizontal fracking rig in the Mahoning Valley Sanitary District's Drinking Water Protection Area. It has been placed on the banks of a stream that runs directly into Meander Reservoir. - A DRIVE-THROUGH is being held Thurs., Sept. 27, 5-6pm (or by appointment) where rig information will be distributed, along with contact information which may be used to inquire as to whether the district, the emergency responders and the operators are prepared for a blow-out. If you are a water customer in Niles, Youngstown, Girard, Austintown, Boardman or Canfield, Ohio - you must SEE IT TO BELIEVE IT! 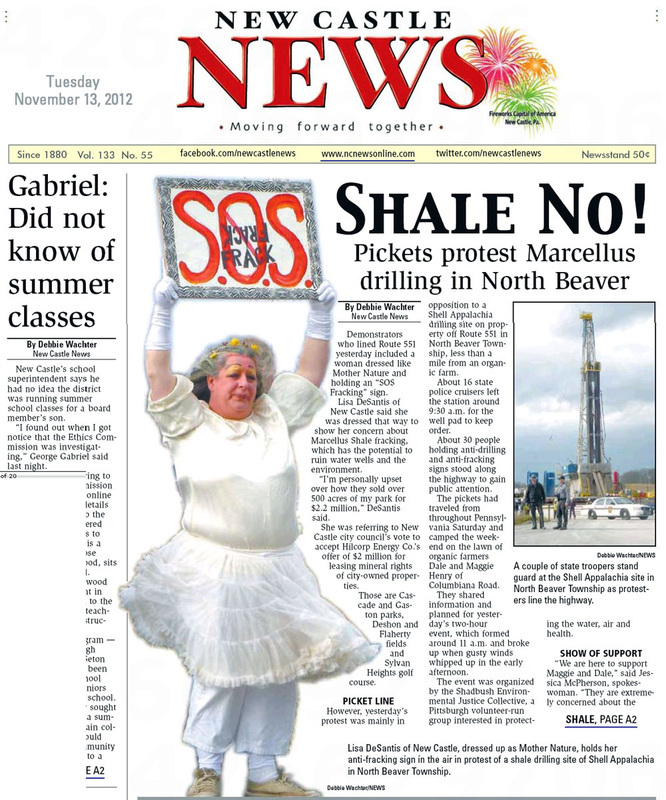 Concerned citizens were on hand to greet returning Y.O.U.N.G Utica shale conference attendees by distributing materials using the industry's own spin. Reflecting industry's misleading information, the welcoming vouchers listed local drinks such as the Cappuccino-defracka and Malignant Melanoma Latte'. Another coupon that could be redeemed for a bottle of Dawn dish soap highlighted the misconception that fracking and drilling fluids are non-toxic. "BP Donates ONE Cow To The Hungry!" read another voucher revealing that the oil company purchased and donated the meat of one cow to the Warren food bank in exchange for threatening all the farmland and water supplies of the entire county with its questionable industry practices. Up the highway from the conference center, citizens from the Valley drew attention to a newly constructed injection well in Girard, Ohio, and to the proposal to begin using it after remedial construction to its depth. 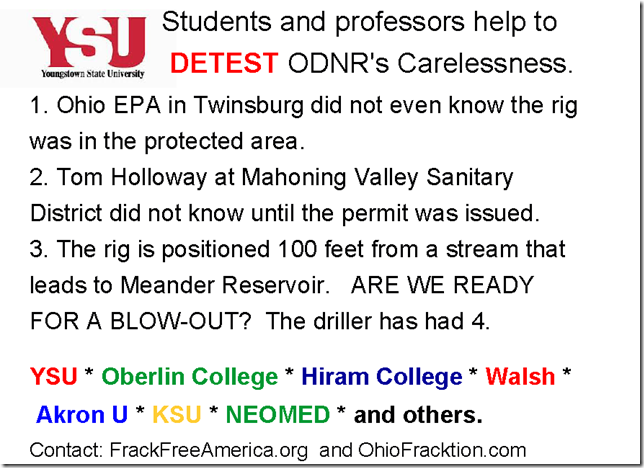 This is one of the 2,456 Class II UIC wells in Ohio that accept toxic fracking wastewater. On September 12, 2012 a national coalition of local coordinators and groups in communities across America will hold simultaneous rallies throughout the day to shine light on the numerous problems associated with toxic fracking waste of all kinds and its disposal, including its links to earthquakes, spills, leaks and contamination." site of Shell Appalachia in North Beaver Township. Demonstrators who lined Route 551 yesterday included a woman dressed like Mother Nature and holding an “SOS Fracking” sign. Lisa DeSantis of New Castle said she was dressed that way to show her concern about Marcellus Shale fracking, which has the potential to ruin water wells and the environment. “I’m personally upset over how they sold over 500 acres of my park for $2.2 million,” DeSantis said. She was referring to New Castle city council’s vote to accept Hilcorp Energy Co.’s offer of $2 million for leasing mineral rights of city-owned properties. Those are Cascade and Gaston parks, Deshon and Flaherty fields and Sylvan Heights golf course. However, yesterday’s protest was mainly in opposition to a Shell Appalachia drilling site on property off Route 551 in North Beaver Township, less than a mile from an organic farm. About 16 state police cruisers left the station around 9:30 a.m. for the well pad to keep order. About 30 people holding anti-drilling and anti-fracking signs stood along the highway to gain public attention. The pickets had traveled from throughout Pennsylvania Saturday and camped the weekend on the lawn of organic farmers Dale and Maggie Henry of Columbiana Road. They shared information and planned for yesterday’s two-hour event, which formed around 11 a.m. and broke up when gusty winds whipped up in the early afternoon. The event was organized by the Shadbush Environmental Justice Collective, a Pittsburgh volunteer-run group interested in protecting the water, air and health. (the drilling) will have on the food that they provide.” Maggie Henry has been attending various shale-related and government meetings as an activist, sharing her concern about hundreds of abandoned gas wells dotting the western end of Lawrence County, several of which surround or are on her farm. She did not attend yesterday’s demonstration because she was sick. There is great concern for the potential for water problems that could arise from drillers hitting those wells, McPherson, of Pittsburgh, said. Joe Minnitte, a Shell case manager, was on site and said the protesters caused no real problems. and to stay off the highway. the churchyard as a landing zone. “We have a duty to protect their safety and protect the drilling business,” explained Sgt. Dan Ekis of the state police in New Castle. “Our primary goal was to keep the residents of this area safe and allow the business people around here to conduct their business. We need to balance that with their right to protest.” The detail had been in the planning since Wednesday last week. “It went exactly as we wanted it to go, and nobody got hurt,” Ekis said.